Radio City Music Hall Live! Was filmed at the iconic New York venue on 30 March 2007. 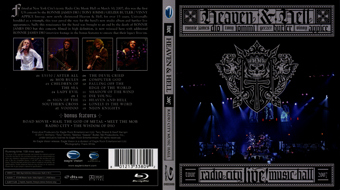 It was the first US concert by the Dio / Iommi/ Butler/ Appice line-up for over 15 years and formed part of Heaven & Hell s 2007 world tour. It was the success of this tour that led to the continued existence of Heaven & Hell, a new studio album and further live dates, and ongoing plans that were only curtailed by the sad death of Ronnie James Dio. Filmed in high definition but originally released on DVD only by SPV in Europe, the show is now being re-released on both DVD and for the first time on Blu-ray by Eagle Vision with additional bonus material.